Franca celebrated Paulista League title. They beat Pailistano on the road to sweep the championship series. The former international point guard Elio Corazza (193-89, college: Miami Dade CC) orchestrated the victory by scoring 17 points and 5 rebounds. 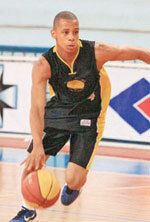 American David Jackson (195-82, college: Penn St.) contributed with 13 points, 5 rebounds and 7 assists for the winners. Five Vivo/Franca players scored in double figures. International point guard Yago Dos-Santos (178-99) replied with 12 points, 5 rebounds and 4 assists and international point guard Georginho de-Paula (195-96) added 9 points in the effort for Paulistano. Paulistano's coach rotated twelve players in this game, but that didn't help.